CAPE CANAVERAL AIR FORCE STATION, FL – The most powerful US Air Force military communications satellite ever built was propelled to orbit by a ULA Delta IV rocket that provided a dinnertime launch delight Wednesday evening for the crowds of spectators gathered around America’s premier gateway to space. Check out this expanding gallery of launch photos and videos from several space journalist colleagues and friends and myself- spread throughout the Florida Space Coast region – giving a comprehensive look as the Wideband Global SATCOM (WGS-8) mission streaked to orbit atop a United Launch Alliance Delta IV rocket from Space Launch Complex 37 (SLC-37) on Cape Canaveral Air Force Station at 6:53 p.m. EST on Dec. 7, 2016. The United Launch Alliance Delta IV Medium+ rocket successfully streaked to the heavens through nearly crystal clear skies to deliver WGS-8 to a supersynchronous transfer orbit. Spectators were rewarded with a picture perfect view of the rocket as it ascended quickly and arced over to the African continent. WGS-8 is the first in a newly upgraded series of a trio of WGS satellites built by Boeing that will nearly double the communications bandwidth of prior WGS models. Watch this video compilation showing the launch from several different vantage points. WGS-8 is the first of three launches from the Cape this December. A Pegasus XL rocket will launch on Dec. 12 carrying NASA’s CGYNSS hurricane monitoring satellites. And an Atlas V will launch on Dec. 18 with the EchoStar 19 comsat. Hoping to recover quickly after suffering a calamitous launch pad explosion of their Falcon 9 rocket at Cape Canaveral some two months ago, SpaceX is aiming to resume launches of the booster in mid-December, said company founder and CEO Elon Musk in a recent televised interview on Nov. 4. Musk further indicated in the Nov. 4 interview with CNBC that they have discovered the problem that suddenly triggered the catastrophic Falcon 9 launch pad explosion that suddenly destroyed the rocket and $200 million Israeli Amos-6 commercial payload during a routine fueling and planned static fire engine test on Sept. 1. Musk said the issue related to some type of interaction between the liquid helium bottles , carbon composites and solidification of the liquid oxygen propellant in the SpaceX Falcon 9 second stage. “It basically involves a combination of liquid helium, advanced carbon fiber composites, and solid oxygen, Musk elaborated. “Turning out to be the most difficult and complex failure we have ever had in 14 years,” Musk previously tweeted on Sept. 9. “It’s never happened before in history. So that’s why it took us awhile to sort it out,” Musk told CNBC on Nov. 4. The explosion took place without warning as liquid oxygen and RP-1 propellants were being loaded into the second stage of the 229-foot-tall (70-meter) Falcon 9 during a routine fueling test and engine firing test at SpaceX’s Space Launch Complex-40 launch facility at approximately 9:07 a.m. EDT on Sept. 1 on Cape Canaveral Air Force Station, Fl. But the rocket blew up during the fueling operations and the SpaceX launch team never even got to the point of igniting the first stage engines for the static fire test. Launch of the AMOS-6 comsat from pad 40 had been scheduled to take place two days later. In company updates posted to the SpaceX website on Sept. 23 and Oct 28, the company said the anomaly appears to be with a “large breach” in the cryogenic helium system of the second stage liquid oxygen tank – but that the root cause had not yet been determined. “This was the toughest puzzle to solve that we’ve ever had to solve,”Musk explained to CNBC. “We have been working closely with NASA, and the FAA [Federal Aviation Administration] and our commercial customers to understand it,” says Musk. Musk was not asked and did not say from which launch pad the Falcon 9 would launch or what the payload would be. “It looks like we’re going to be back to launching around mid-December,” he replied. SpaceX maintains launch pads on both the US East and West coasts. “Pending the results of the investigation, we continue to work towards returning to flight before the end of the year. Our launch sites at Kennedy Space Center, Florida, and Vandenberg Air Force Base, California, remain on track to be operational in this timeframe,” SpaceX said on Oct 28. At KSC launches will initially take place from pad 39A, the former shuttle pad that SpaceX has leased from NASA. Pad 40 is out of action until extensive repairs and testing are completed. The Sept. 1 calamity was the second Falcon 9 failure within 15 months time and will call into question the rockets overall reliability. The first Falcon 9 failure involved a catastrophic mid air explosion in the second stage about two and a half minutes after liftoff, during the Dragon CRS-9 cargo resupply launch for NASA to the International Space Station on June 28, 2015 – and witnessed by this author. Although both incidents involved the second stage, SpaceX maintains that they are unrelated – even as they continue seeking to determine the root cause. 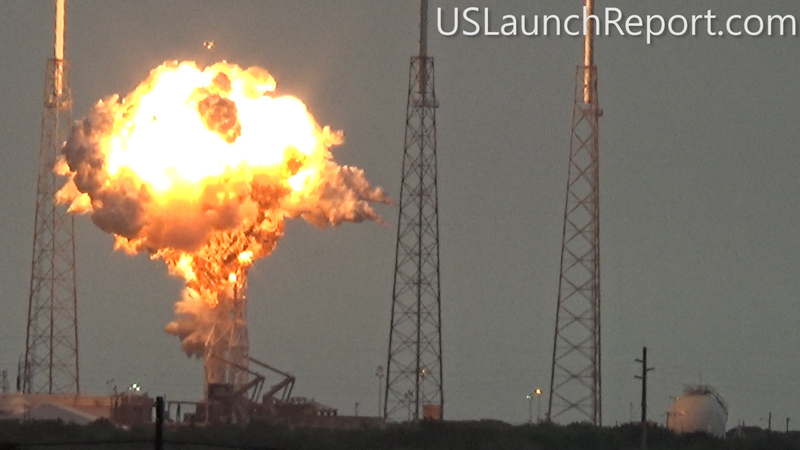 SpaceX must determine the root cause before Falcon 9 launches are allowed to resume. Effective fixes must be identified and effective remedies must be verified and implemented. A US Federal Court has now issued a preliminary injunction that blocks the purchase and importation of Russian rocket engines by United Launch Alliance (ULA) for its Atlas V rocket used in National Security launches for the US Air Force after a filing by SpaceX. But what are the implications? The US Federal Court of Federal Claims order was issued late Wednesday, April 30, by US Judge Susan G. Braden of the US Court of Federal Claims. The court order is in response to a protest filed by SpaceX against ULA and the US Air Force relating to the uncontested $11 Billion “block buy” launch contract purchase in December of 36 rocket cores for US National Security launches and is also related to US sanctions imposed after Russia’s recent actions in Ukraine and seizing and annexing the Crimea. The temporary injunction marks a big win for SpaceX but immediately throws future National Security spy satellite and NASA science launches into uncertainty and potential disarray as I reported previously – here and here. As I posted here last Friday, April 25, SpaceX CEO Elon Musk declared his firms intent to file suit against ULA and the Air Force on Monday, April 28 to break the launch monopoly. Judge Braden’s injunction followed barely two days later. Musk said the recent ‘block buy’ launch contract was unfair in blocking SpaceX from competing for launches of surveillance satellites, would cost taxpayers billions of extra dollars in coming years and should be recompetited. “The national security launches should be put up for competition and they should not be awarded on a sole source, uncompeted basis,” Musk said at the April 25 briefing at the National Press Club in Washington, DC. “IT IS SO ORDERED,” wrote Braden. The engines at the heart of the Federal preliminary injunction are the RD-180 liquid fueled engines which power ULA’s Atlas V rocket and are manufactured in Russia by NPO Energomash – which is majority state owned by the Russian Federation and subject to the control of Russian Deputy Prime Minister Rogozin, who is specifically named on the US economic sanctions target list. Thanks to the utter folly of US politicians in shutting down the Space Shuttle program before a replacement crew vehicle was available and repeatedly slashing NASA’s commercial crew budget, American astronauts are now 100% dependent on the Russian Soyuz capsule for rides to the ISS and back for several more years ahead. NASA has NO immediate alternatives to Russia’s Soyuz – period. The rocket engine injunction is just the latest fallout impacting a vast swath of US space programs from National Defense to NASA stemming from the dangerously escalating crisis between Ukraine and the Russian Federation in the worst confrontation with the West since the Cold War era. In response to the worsening Ukraine crisis, Western nations have instituted waves of increasingly harsh economic sanctions against Russia and several key members of the Russian government. Judge Braden’s injunction stands until she receives clarification otherwise from US government entities that the engine purchase is not covered by the Federal government santions. ULA issued a swift statement today – received by Universe Today – from ULA’s general counsel Kevin G. MacCary, in response to Judge Braden’s preliminary injunction. The Atlas V rocket, powered by the Russian made RD-180 engines, will also be used as the launch vehicle by two of the three companies vying for the next round of commercial crew contracts aimed at launching US astronauts to the ISS. The contracts will be awarded by NASA later this year. “This opportunistic action by SpaceX appears to be an attempt to circumvent the requirements imposed on those who seek to meet the challenging launch needs of the nation and to avoid having to follow the rules, regulations and standards expected of a company entrusted to support our nation’s most sensitive missions,” said ULA. ULA is a joint venture between aerospace giants Boeing and Lockheed Martin, formed in 2006. It has conducted 81 consecutive launches with 100% mission success – including many NASA science and mission probes like Orion EFT-1, Curiosity, MAVEN, TDRS and more. Judge Braden furthermore made clear that her order did not include prior RD-180 engine purchases. ULA has a two year contingency supply of the RD-180’s and blueprints to begin production, if needed. 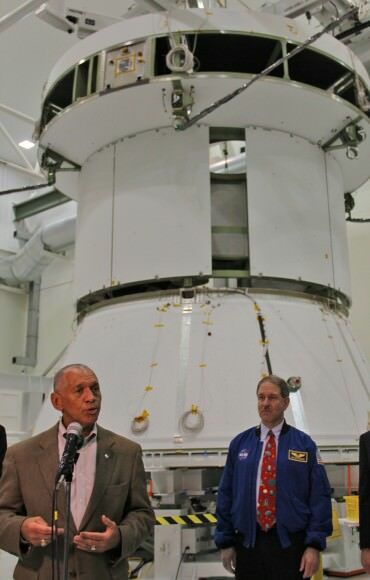 However in the event of a cutoff by Russia or US court injuncions, it would take ULA at least three to five years to start and certify RD-180 engine production somewhere in the US, a ULA spokesperson told me recently at Cape Canaveral. This possibly leaves a 1 to 3 year gap with no Atlas V 1st stage engine supply. SpaceX claims they can fill part of the launch gap. But their Falcon rockets are not yet certified for National Security launches. “In light of international events, this seems like the wrong time to send hundreds of millions of dollars to the Kremlin,” said Musk during the April 25 press briefing at the National Press Club in Washington, DC. Watch for my continuing articles as the Ukraine crisis escalates and court orders fly – with uncertain and potentially dire consequences for US National Security and NASA. Stay tuned here for Ken’s continuing SpaceX, Orbital Sciences, commercial space, Orion, Chang’e-3, LADEE, Mars rover, MAVEN, MOM and more planetary and human spaceflight news. NASA’s Curiosity rover launches to Mars atop Atlas V rocket on Nov. 26, 2011 from Cape Canaveral, Florida. Atlas V 1st stage is powered by Russian made RD-180 engines. Elon Musk, CEO and founder of the upstart commercial launch venture SpaceX, announced at a press conference today, Friday, April 25, that SpaceX is filing suit against the Federal Government to protest and break the US Air Force’s awarding of lucrative launch contracts for high priority national security satellites to a sole rocket provider – United Launch Alliance (ULA) – on a non competitive basis. The gloves are officially off in the intensely mounting duel over multibillion dollar Air Force military launch contracts between SpaceX and ULA. “The official protest document will be available Monday, April 28th at www.freedomtolaunch.com and will be filed with the United States Court of Federal Claims in Washington, D.C.,” said SpaceX in an official statement. Musk said the Air Force launch contract with ULA amounted to a continuing monopoly, was unfair by blocking SpaceX from competing for launches of surveillance satellites and would cost taxpayers billions of extra dollars in coming years. “What we feel is that this is not right – that the national security launches should be put up for competition and they should not be awarded on a sole source, uncompeted basis,” said Musk at the briefing called on short notice and held at the National Press Club in Washington, DC. The latest Air Force launch contract dated to December 2013 guarantees the “block buy” purchase of 36 rocket cores from ULA for national security launches for the DOD, NRO and other government agencies, at a significantly reduced cost compared to earlier contracts. A further 14 cores were to be awarded on a competitive basis, including bids from SpaceX and others who seek to gain Air Force certification. Several of those launch awards have now been deferred indefinitely. ULA is a joint venture between aerospace giants Boeing and Lockheed Martin, formed in 2006, that has launched over 80 satellites to orbit and beyond including many NASA science and mission probes like Orion EFT-1, Curiosity, MAVEN, TDRS and more. It manufactures the Delta IV and Atlas V unmanned, expendable rocket families that are currently the only boosters certified to launch the high value military payloads at issue in the lawsuit announced on Friday by Musk. The newest versions of the Delta and Atlas rockets – known as EELV’s (Evolved Expendable Launch Vehicles) have had nearly flawless records of success since being introduced some dozen years ago by the companies individually, before the ULA merger. Musk wants his company’s newer and he says much cheaper Falcon 9 and Falcon Heavy rockets to be certified by the Air Force and included in the competition for launch contracts. To date the Falcon 9 has launched only 9 times. Only four of those were in the new and more powerful configuration needed by the Air Force. Musk is not asking that the launches be awarded outright to SpaceX. But he does want the Air Force contract cancelled and re-competed. “We’re just protesting and saying that the launches should be competed,” Musk said. Musk said it costs four times more to launch ULA’s Delta or Atlas rocket vs. a SpaceX Falcon rocket. The Falcon 9 lists for about $60 Million per launch, but rises to about $100 million after the certification costs are included, Musk explained. “Our rockets are 21st century design,” said Musk to obtain the most efficiency. He said ULA’s designs date back to the 90s and earlier with heritage hardware. To date the Falcon 9 has already been used three times under a $1.6 Billion contract with NASA to launch the private SpaceX Dragon resupply vessel to the International Space Station (ISS) – most recently a week ago during the April 18 blastoff of the SpaceX CRS-3 mission from Cape Canaveral. It is also being used to launch highly expensive communications satellites like SES-8 and Thaicom-6 for private companies to geostationary orbits. “It just seems odd that if our vehicle is good enough for NASA and supporting a $100 billion space station, and it’s good enough for launching NASA science satellites, for launching complex commercial geostationary satellites, then there’s no reasonable basis for it not being capable of launching something quite simple like a GPS satellite,” said Musk. Furthermore as I wrote here in a prior article, US National Security launches are now potentially at risk due to the ongoing crisis between Russian, Ukraine and Crimea because the RD-180 first stage engines powering the Atlas V are designed and manufactured in Russia by NPO Energomash, majority owned by the Russian Federation. “The head of the Russian space sector, Dmitry Rogozin, was sanctioned by the White House in March 2014 in the wake of Russia’s aggression in Ukraine,” says SpaceX. The RD-180 engine supply could be cut off in a worst case scenario if economic sanctions against Russia are increased by the Western allies. However in the event of a cutoff, it would take at least three to five years to start and certify RD-180 engine production somewhere in the US, a ULA spokesperson told me recently at Cape Canaveral. The Delta IV rockets and engines by contrast are manufactured in the US. “In light of international events, this seems like the wrong time to send hundreds of millions of dollars to the Kremlin,” said Musk. CAPE CANAVERAL AIR FORCE STATION, FL – The urgent need by the US Air Force to launch a pair of previously classified Space Situational Awareness satellites into Earth orbit this year on an accelerated schedule has bumped the inaugural blastoff of NASA’s highly anticipated Orion pathfinder manned capsule from September to December 2014. It’s a simple case of US national security taking a higher priority over the launch of NASA’s long awaited unmanned Orion test flight on the Exploration Flight Test-1 (EFT-1) mission. The EFT-1 flight is NASA’s first concrete step towards sending human crews on Beyond Earth Orbit (BEO) missions since the finale of the Apollo moon landing era in December 1972. Final assembly of Orion is underway at the Kennedy Space Center (KSC). The very existence of the covert Geosynchronous Space Situational Awareness Program, or GSSAP, was only recently declassified during a speech by General William Shelton, commander of the US Air Force Space Command. Shelton made the announcement regarding the top secret GSSAP program during a Feb. 21 speech about the importance of space and cyberspace at the Air Force Association Air Warfare Symposium and Technology exposition, in Orlando, FL. US national security requirements forced NASA’s Orion EFT-1 mission to swap launch slots with the GSSAP satellites – which were originally slated to launch later in 2014. Since both spacecraft will blast off from the same pad at Complex 37 and atop Delta rockets manufactured by United Launch Alliance (ULA), a decision on priorities had to be made – and the military won out. At a Cape Canaveral media briefing with Delta first stage boosters on Monday, March 17, Universe Today confirmed the order and payloads on the upcoming Delta IV rockets this year. “The firing sequence for the Delta’s is the USAF Global Positioning System GPS 2F-6 [in May], GSSAP [in September] and Orion EFT-1 [in December], Tony Taliancich, ULA Director of East Coast Launch Operations, told me. Universe Today also confirmed with the top management at KSC that NASA will absolutely not delay any Orion processing and assembly activities. Despite the EFT-1 postponement, technicians for prime contractor Lockheed Martin are pressing forward and continue to work around the clock at the Kennedy Space Center (KSC) so that NASA’s Orion spacecraft can still meet the original launch window that opens in mid- September 2014 – in case of future adjustments to the launch schedule sequence. “Our plan is to have the Orion spacecraft ready because we want to get EFT-1 out so we can start getting the hardware in for Exploration Mission-1 (EM-1) and start processing for that vehicle that will launch on the Space Launch System (SLS) rocket in 2017,” Bob Cabana, director of NASA’s Kennedy Space Center and former shuttle commander, told me. Shelton stated that two of the GSSAP military surveillance satellites would be launched on the same launch vehicle later this year. “GSSAP will present a significant improvement in space object surveillance, not only for better collision avoidance, but also for detecting threats,” Shelton said. According to a new GSSAP online fact sheet, the program will be a space-based capability operating in near-geosynchronous orbit, supporting U.S. Strategic Command space surveillance operations as a dedicated Space Surveillance Network sensor. GSSAP will allow more accurate tracking and characterization of man-made orbiting objects, uniquely contribute to timely and accurate orbital predictions, enhance knowledge of the geosynchronous orbit environment, and further enable space flight safety to include satellite collision avoidance. The GSSAP satellites were covertly developed by Orbital Sciences and the Air Force. Two additional follow on GSSAP satellites are slated for launch in 2016. Orion is NASA’s first spaceship designed to carry human crews on long duration flights to deep space destinations beyond low Earth orbit, such as asteroids, the Moon, Mars and beyond. The inaugural flight of Orion on the unmanned Exploration Flight Test – 1 (EFT-1) mission had been on schedule to blast off from the Florida Space Coast in mid September 2014 atop a Delta 4 Heavy booster, Scott Wilson, NASA’s Orion Manager of Production Operations at KSC, told Universe Today during a recent interview at KSC. The two-orbit, four- hour EFT-1 flight will lift the Orion spacecraft and its attached second stage to an orbital altitude of 3,600 miles, about 15 times higher than the International Space Station (ISS) – and farther than any human spacecraft has journeyed in 40 years. Stay tuned here for Ken’s continuing Orion, Chang’e-3, Orbital Sciences, SpaceX, commercial space, LADEE, Mars rover, MAVEN, MOM and more planetary and human spaceflight news. An Atlas V rocket launched from Cape Canaveral Air Force Station today, carrying the Air Force’s X-37B space plane into orbit on its third classified mission. Launch took place at 1:03 EST (18:03 UTC) for the unmanned Orbital Test Vehicle (OTV), which looks like a mini space shuttle. The U.S. Air Force has not released any details of what may be on board the vehicle or what its mission may be. United Launch Alliance provided a webcast of the launch, but the broadcast was ended “at the request of our customer (the Air Force),” when the space plane successfully reached orbit. See a video of the launch, below. The X-37B is launched like a satellite and rides inside the fairing of the Atlas rocket. The X-37B can operate at in low Earth orbit for extended periods of time – the previous mission stayed in orbit for 469 days – and can re-enter Earth’s atmosphere and land on autopilot, landing just like a plane on a runway at Vandenberg Air Force Base in California. While looking much like the space shuttle, the X-37B is about 1/4 the size of NASA’s space shuttle’s and is built using composites lighter than aluminum, and it uses a new type of leading wing tiles, called Tough Rock, instead of the shuttle’s carbon-carbon tiles. It runs on solar power allowing for longer missions. The plane itself is not so secretive – the Air Force has released images of it while it is on the ground – but its mission and payload are what are kept confidential. The mission could be Earth observation, surveillance or spying, or perhaps deploying a satellite. The launch was delayed several times so that ULA could investigate a glitch during a launch back in October. “We had a little bit of concern with our upper stage engine, so we wanted to do some investigation and look into what was going on with that engine prior to (launch of the Orbital Test Vehicle),” said Jessica Rye, a ULA spokesperson. In past missions, satellite watchers and amateur astronomers have kept tabs on the X-37B’s orbital whereabouts, and thanks to them, we expect to be able to provide small details about the space plane’s mission in the coming months. A top secret US national security Spy satellite for the National Reconnaissance Office (NRO) roared mightily to space this morning (June 20) through picturesque layers of broken clouds an Atlas V rocket at 8:28 a.m. EDT (1228 GMT) from Space Launch Complex-41 on Cape Canaveral Air Force Station, Fla.
Basically nothing is publicly known about the specifications or mission of the vital payload, dubbed NROL-38, launched in support of America’s national defense. The classified mission entered a total news blackout and cutoff of the live webcast some five minutes after launch when the rocket’s first stage and upper stage engine separated successfully and before the secret satellite was deployed and reached orbit. The flight marked a key milestone as the 50th successful launch of the combined Atlas V and Delta IV booster families collectively known as the Evolved Expendable Launch Vehicle (EELV) built by United Launch Alliance (ULA). The maiden launch took place in 2002. ULA was formed in 2006 as a partnership between Boeing and Lockheed Martin who were originally in competition at the start of the EELV program. “This morning’s flawless launch is the product of many months of hard work and collaboration of government and industry teams. We hit it out of the park again as we continue to deliver superior vigilance from above for the Nation,” remarked Col James D. Fisher, Director of Office of Space Launch. Threatening clouds and gusting winds remained within acceptable levels and did not delay the launch. The 19 story Atlas booster first stage was powered by the RD AMROSS RD-180 engine and the Centaur upper stage was powered by a single Pratt & Whitney Rocketdyne RL10A-4 engine. The NROL-38 spy satellite is the first of three critical NRO missions slated for launch by ULA over the next two months. The NRO is based in Chantilly, Va. and the U.S. Government agency responsible for designing, building, launching, and maintaining America’s intelligence satellites. Indeed the next NRO satellite is currently scheduled for blastoff in the early morning hours of June 28 atop a Delta 4 Heavy booster rocket, now the most powerful rocket in the US arsenal following the forced retirement of NASA’s trio of Space Shuttle orbiters and which will surely put on a spectacular sky show ! The likewise classified NROL-15 mission will lift off next Thursday from Space Launch Complex-37 at Cape Canaveral. The EELV Program was developed by the United States Air Force to provide assured access to space for Department of Defense and other government payloads, achieve significant cost savings and reliably meet launch schedule targets as older booster such as the Titan were phased out. ULA will be getting some competition. SpaceX Corporation – which recently dispatched the first private spacecraft (Dragon) to dock at the ISS – will compete in the bidding to launch future US national security payloads. Image Caption: 2nd X-37B Orbital Test Vehicle Successfully Completes 1st Flight by landing at Vandernberg AFB, Calif., on June 16, 2012. The record setting mission lasted 469 days in earth orbit. Designed to be launched like a satellite and land like an airplane, the second X-37B Orbital Test Vehicle, built by Boeing for the United States Air Force’s Rapid Capabilities Office, is an affordable, reusable space vehicle. Credit: Boeing. The 2nd of the US Air Force’s top secret X-37B unmanned, reusable mini shuttles safely landed on Saturday, June 16, at 5:48 a.m. Pacific local time at Vandenberg Air Force Base, California to conclude a record setting classified 469 day experimental test flight in Earth orbit. This was the first flight of OTV-2 and the second flight of the military’s classified X-37B Orbital Test Vehicle (OTV) test program for the U.S. Air Force Rapid Capabilities Office. The reusable space plane is designed to be launched like a satellite and land on a runway like an airplane and NASA space shuttle. The X-37B is one of the newest and most advanced reentry spacecraft. OTV-2 was launched atop a United Launch Alliance Atlas V booster from Cape Canaveral Air Force Station, Fla., on March 5, 2011. About 18 minutes after launch, the Air Force imposed a news blackout on the classified mission. Details about the cargo and experiments loaded aboard the Air Force orbital space plane are shrouded behind a veil of military security. The Air Force says the primary mission goal was to check out the vehicles capabilities and testing the ability to send experiments to space and return them safely. The mission duration of well over one year far exceeded the 220-day mission duration of the first OTV craft and tested additional capabilities. Two OTV vehicles have been built by Boeing. The first craft, known as OTV-1, was the United States’ first unmanned vehicle to return from space and land on its own. Previously, NASA space shuttles piloted by astronauts were the only space vehicles that had demonstrated the capability of returning to Earth and being reused. The 11,000 pound state-of -the art reusable OTV space plane was built by Boeing and is about a quarter the size of a NASA space shuttle. It was originally developed by NASA but was transferred to the Defense Advanced Research Projects Agency (DARPA) in 2004. Among the cutting-edge technologies tested were the auto de-orbit capability, thermal protection tiles, and high-temperature components and seals. OTV-1 may lift off as early as October 2012 from Cape Canaveral. “We look forward to the second launch of OTV-1 later this year and the opportunity to demonstrate that the X-37B is an affordable space vehicle that can be repeatedly reused,” said Paul Rusnock, Boeing vice president of Government Space Systems.